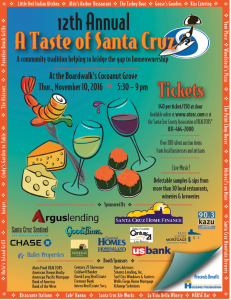 The 10th annual “A Taste of Santa Cruz,” at the Cocoanut Grove on Thursday, Nov. 13, features approximately 30 participating restaurants, wineries, and breweries. The event runs from 5:30-9 p.m. and benefits first-time home buyers. Tickets are $40 in advance or $50 at the door. Buy tickets online. 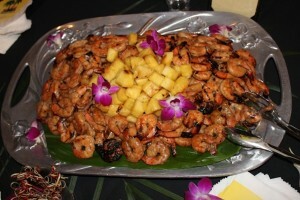 For more information, visit the site www.atosc.com or call 831-464-2000. 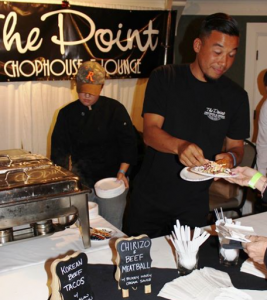 Attendees sample food and drinks, and all proceeds from the event benefit the Santa Cruz Association of REALTORS Housing Foundation grant program that provides closing costs for first time, low-income home-buyers in Santa Cruz County. Participating food providers include Aldo’s, Assembly, Chaminade, Paradise Beach Grille, Pleasure Pizza’s East Side Eatery, Crow’s Nest, Hula’s, Johnny’s Harborside, Mission Hill Creamery, Shadowbrook, The Point, The Kitchen at Discretion Brewery, Stagnaro Bros. Seafood, and Woodstock’s Pizza. 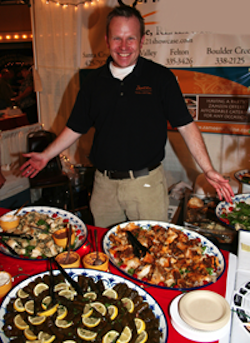 Wineries and breweries include Trout Gulch Vineyards, Storrs Winery, MJA Vineyards, and Uncommon Brewers. Other highlights at the event: more than 100 raffle prize packages from local businesses and artisans. Prizes include a Las Vegas penthouse stay, four floor seats to a Santa Cruz Warriors game, and four club seats plus VIP parking to a SF Giants game. 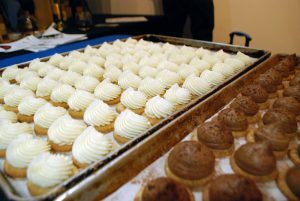 Several hundred people attend this event, raising approximately $30,000 annually. Purchasing your tickets in advance is recommended.